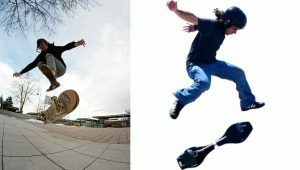 Skateboard vs Caster board are divided into many categories like skateboards, longboards, penny boards and caster boards. They’re all cool to try out but today we’ll be focusing on skateboards and caster boards. Skating, whether it’s done on a skateboard or longboard, is widely done by people around the world. Some use them for transport, some do it for a living and others just do it for fun. Below we’ll talk about the differences between a skateboard and a caster board. 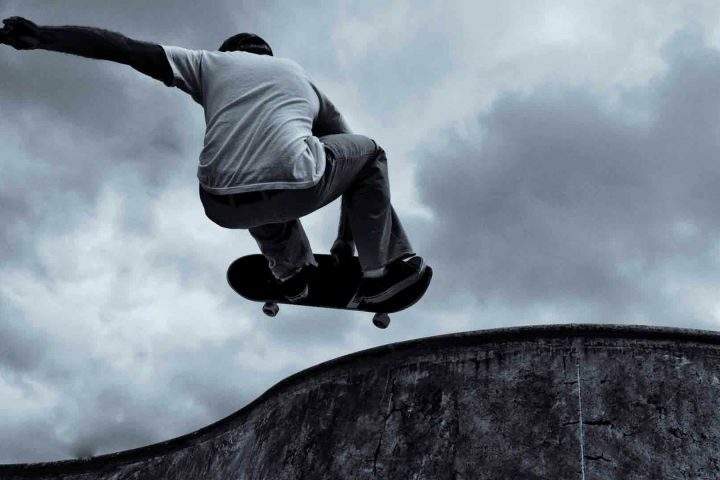 Skateboarding is one of the most popular sports done out of all the others in this category. It is widely done by the kid, teenagers, and adults. Can be used for transport and also for cool tricks, mainly used on the streets and skate parks. The board comes in a rectangular shape with various sizes from 7.25 to 8.5 inch. 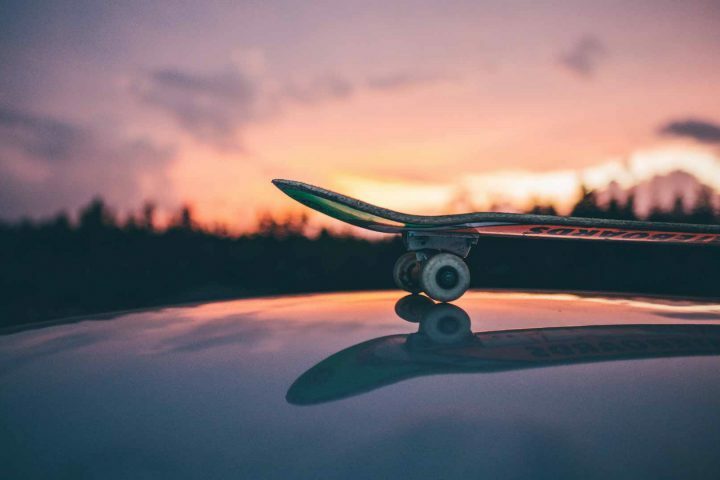 Skateboards are used a lot in skate parks, empty pools, bowls, half pipe or quarter pipe and of course the streets. Most skateboards have 2 aluminum trucks with 4 hard or soft wheels attached to them. Skateboards are really fun and doing tricks on them just makes them a lot better than they are. The caster board is different in shape and size but serves the same purpose as skateboards. The caster board is sometimes called the wave board. This is pretty much formed with two boards joined together by a Torsion bar which is made of steel which holds the two decks together. The decks are designed with waves and curves on them to look different and go faster when riding. A skate has four wheels below but the caster board only features two. 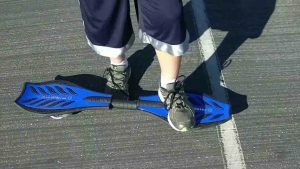 It takes a little bit of practice to ride a caster board as it requires you to lean your legs from side to side to avoid touching the ground. It’ll feel difficult at first but trust me once you get a hang of it it’ll be a part of your daily life. The caster boards and skateboards aren’t really that different if compared with one another as they both serve the same purpose. As for skateboards since it’s more popular it has more boards available for beginners and intermediate skaters, it’s easy to learn and can help you travel those short distances like from school to home or to work. Caster boards, on the other hand, are a little bit tricky to learn and do require more practice than a skateboard. Skateboards have four wheels; the board basically lays flat on its own and only requires you to maintain your body balance. Caster boards however only have two wheels so you’ll have to worry about balancing your body and keeping the board on its wheels and not on its side. A variety of tricks can also be done on caster boards and there are many designs for both beginners and advanced skaters. They do serve the same purpose but are designed very differently. A skateboard has a simple design with round edges, a nose, and tail with concaves and grip tape. Very comfortable to ride with enough room for the feet that’s if you purchased the right size for yourself. Caster boards are very different in design, the cut edges with curves help turn the board better and also helps to make it go faster. The board, however, does not have a grip tape but has curved lines all over the deck to help hold your feet in place and offer grip. Some caster boards have a Torsion bar in the middle that joins the two decks together. No matter what type of board you ride, good wheels are always important to give you the best riding experience. Skateboards have four small wheels which are either hard wheels or soft wheels. Hard wheels are made of polyurethane and are used mostly for street skating and in parks. Soft wheels make it easier to travel on rough surfaces. Caster boards only have two wheels with one on each end placed in the middle of the deck. This requires the rider to balance the board on those two wheels and as hard as that sounds, once you get a hang of it, it’ll feel just normal. The two-wheel design helps you take really sharp turns on the board very easily. Where to place your feet on the deck? 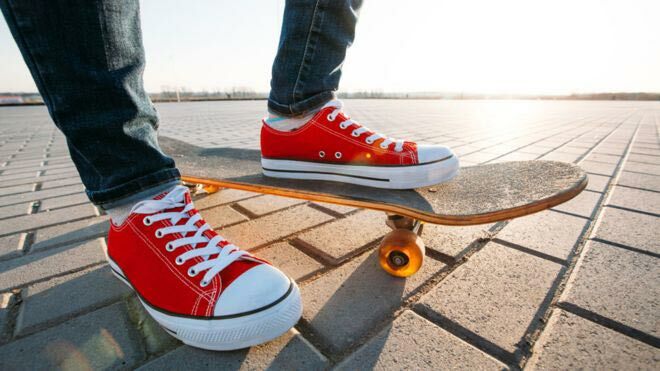 One of the most important steps to learning how to skate is foot placement. It is important to place your foot in the correct position in order to turn properly and control the board. On a skateboard that’s pretty easy, just place both of your feet on the bolts. With the added support of the ground if you keep your body balanced you’ll be standing perfectly fine on your skateboard without going anywhere. On a caster board it’s different, your feet need to be exactly in the place to balance the board on two wheels. You also have to maintain your body weight to keep the board balanced and not hitting the sides. Practice is required to learn this on a caster board. Skateboards aren’t electric; they don’t have motors unless it’s an electric skateboard. So you have to use your physical strength to get the board moving. Skateboards are pretty easy, just stand on it use your back foot to push off the ground and your board moves forward unless you’re going down a slope. Caster boards, however, require more power and force. Pushing with your foot isn’t always applied on caster boards. Since it stands on two wheels you need to use your body to keep it balanced and moving forward. To move forward you need to apply pressure on your front foot, this force will make the caster board move forward with any trouble. You can do hundreds of tricks on a skateboard! Seriously there’s so much you can do it crazy. Skateboard is home for almost all tricks done on any board. 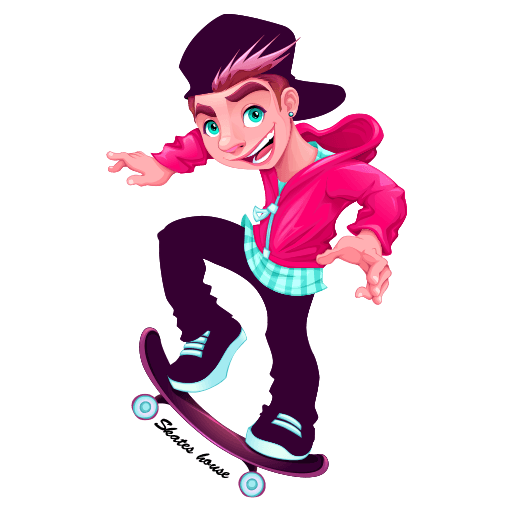 You can do tricks at high speeds, over obstacles and also grind on ledges and rails. Tricks can also be done on caster boards but it has its limit due to its design. But on a skateboard turning isn’t as fun and easy as it is on a caster board. You can take sharp turns are really high speeds and not have to worry about stopping or stepping off your board. Which one should you learn first? If you’re new to the skating world and you’re just starting out we recommend you try skateboarding first as it covers up all the basics of skating. These basics are very easy to learn and master on a skateboard and will get you prepared for other boards like the caster board. Learning tricks is all up to you if you wish to do so just make sure you follow the steps. These are the differences between a skateboard and a caster board. Both a really fun to ride and both have a unique style. Skating is so much fun if you put your time and dedication into it hard work always pays off guys. Always remember to your protective gears as accidents can occur at any time, I wish you all good luck and keep shredding.